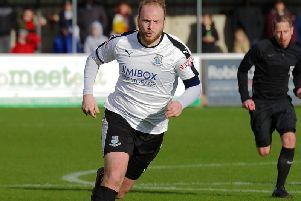 Bamber Bridge have made their first signings of the summer as they begin preparations for life in the NPL Premier Division next season. It may only be a few weeks after their glorious First Division North play-off final victory over Prescot Cables at the Sir Tom Finney Stadium, but boss Neil Reynolds is certainly not resting on his laurels. Already he has moved quickly to tie up loan stars Adam Roscoe and Kieran Charnock, who were released by their parent club Chorley at the weekend, on permanent deals. Charnock arrived at Irongate at the start of last season and formed a formidable partnership in the centre of defence with captain Matt Lawlor. Roscoe joined much later in the season, but still made a valuable contribution to Brig’s promotion campaign. As well as those two, Reynolds has sealed a deal for right-back Paul Dawson from Kendal Town. The Brig boss is also in discussions with four other players. They are Clitheroe centre half Danny Brady, Droylsden striker Sefton Gonzalez, Trafford midfielder Scott Sephton and Skelmersdale United attacker Scott Bakkor. Reynolds revealed that the restof his existing squad have indicated they will be returning for pre-season training. “I have spoken to both Adam and Kieran and they both are happy to come back,” said Reynolds. “Kieran was a revelation when he came in and personally, I think we haven’t seen the best of Adam yet.